As much as I love all things style and beauty, the one area where I fall short (i.e., just don’t care that much about) is my hair! I wash it only as often as necessary, rarely curl or style it, and kind of just let it do its own thing. Do I wish I had fantastically-styled gorgeous locks every day? Sure! Do I want to put in the effort to do it? Nope. That’s why when I discovered the best hair dryer for my straight hair, I had to share it with the world! The Revlon One-Step Hair Dryer & Volumizer looked a little intimidating to me at first. As a kid any kind of round brush always, always got tangled in my hair. The thought of this dryer brush, combined with heat, made me imagine all kinds of horrific scenarios that left me singed and bald! 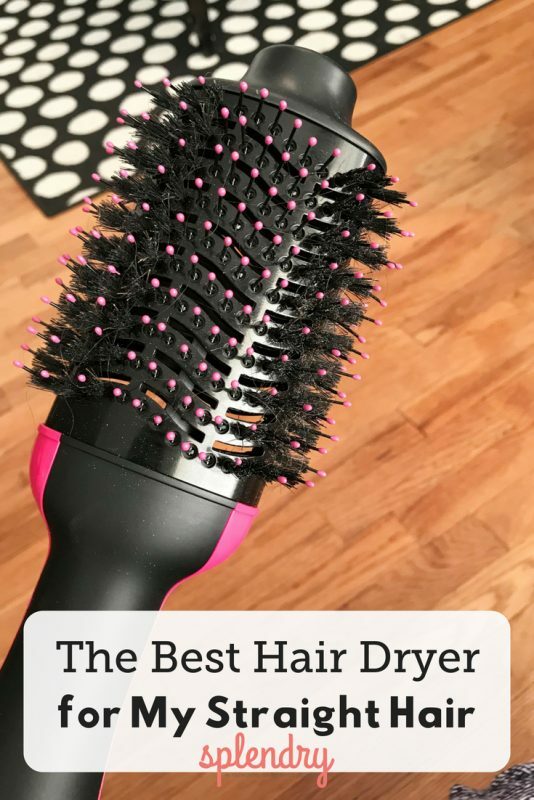 But after hearing so many good reviews about this dryer, I figured it was worth a shot! First of all, I wish I had tried this years and years ago! All the hair issues I have are pretty much solved with this genius hair dryer! It’s so easy to use! All my fears of tangled hair were completely unfounded. My hair glides easily through the brush with no tangles or knots. I get the volume I want with a professional-looking blow-out with much, much less effort. It cuts down on my styling time. Instead of spending the time drying my hair and then using a flat-iron to make sure the ends are curled under (or whatever look I’m going for), now I just need the Revlon One-Step to dry AND style. It’s under $100. Other fancy dryers I’ve look at have been in the $200-$300 range. This one? Just $59.99! Bottom line, it’s worked great for my medium fullness, zero volume, super straight hair! Have you tried it?